I was getting bored waiting for Trolltech to release the next version of Qtopia for the Freerunner, so I ported the xgps client from gpsd's distribution to Qtopia. As you may know by now, Qtopia does not have X11 so none of the existing X11 based or GTK based GPS clients work. 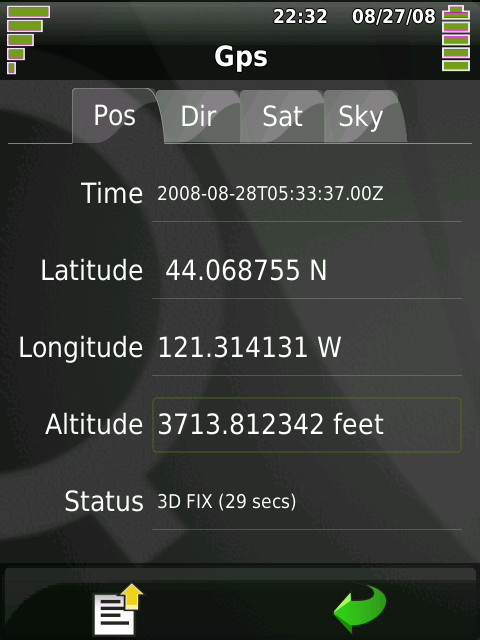 I was exploring GPSD because I wanted to to be able to get a one time position for my sunset calculator which requires your current latitude and longitude. Although GPSD is not well suited for that (thats a whole other blog entry), I did notice you can connect to it over the ethernet, so I was playing with cgps and xgps that you find in the GPSD tar file, running on my desktop, talking to gpsd running on my Freerunner. So wanting to dust of my Qt skills (which were so ancient I barely even recognize Qt4) I decided to port xgps to Qt. I first did a pretty straight forward port to my Desktop Qt4/X11. I designed the form using designer, then plugged in the code taken as closely as I could from xgps. This was not 1:1 by any means as XLib and Qt are not similar ;) I ended up just taking the ideas and algorithms from the xgps program and recoding. So that took a day or so, as I was relearning Qt as I went, I have to say the documentation for Qt is excellent, unlike another graphics library I could mention (I'm looking at you GTK). I got the basics working, and as my GPS fix inside was not very good (works about 50/50), I found you could also point any gpsd based client at gpsd.rellim.com and always get good data from there, this is great for testing. 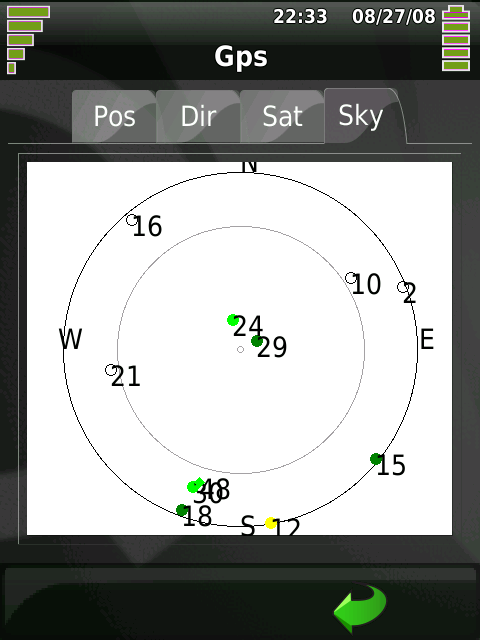 So I had qtgps (for want of a better name) running on my desktop, looking pretty much the same as xgps, with the satellite list the sky view and of course the basic Fix data. Now the trick to port it to FR, so I could run this on my FR. The UI wasn't going to fit on the FR screen so I revamped the UI in Designer, by basically dragging all the views into a tabbed frame. 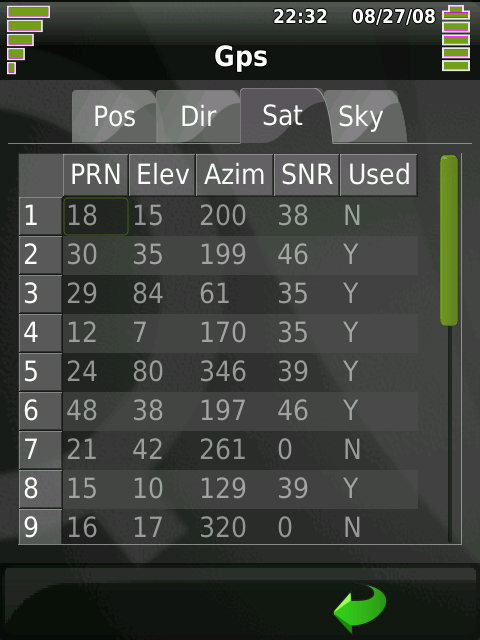 So the satellite list, the sky view, the position information and the movement information all had their own tab, this fits pretty well on a tiny screen. Other than that I didn't have to do much. I had to create a new qtgps.pro file for Qtopia, as the qmake qt one is somewhat different. I had to use the skeleton main.cpp that all Qtopia apps seem to use, but the bulk of the code remains the same. I did have an interesting time trying to figure out how to emit a signal from the gps callback thread to the main window, not sure if I chose the right way to do it but it worked... I created a singleton QObject based class, and allowed it to be called statically, then that does the emit. This is used to signal the main display thread that new gps data has arrived. (Note this won't work if the singleton can be called concurrently from multiple threads, Google c++ singleton pattern to see how to do that). Ok so how can you write your own Qtopia applications? There are at least two ways, 1) use the VMPlayer based Toolchain that Trolltech provide, or 2) setup your Linux workstation to use the toolkit. 1) is easier, and just works on pretty much anything that runs VMPlayer and has a lot of memory. 2) is faster and used less memory. I chose 2) but I did play with 1). I won't go into how to do 1) as it is pretty much straight forward, just download the iso, and install it (either from a loopback device or from a burned CD). The second method is not so well documented (if at all) so here is what I did to make it work on a Ubuntu Hardy i686 32-bit workstation with KDE installed..
Download the toolchain and install it into /opt/toolchains, it seems it must be there otherwise it doesn't quite work. Then download the latest qtopia snapshot and put that in a working directory and set QTOPIA_DEPOT_PATH to that directory. Then create a build directory for the qtopia build and set the QPEDIR environment variable to that path. Now we need to build the qtopia snapshot, you can use the result to copy to /opt/Nokia/Qtopia on your FR, or not, but you need to do this to get the tools to build your own apps. NOTE You may need to set -prefix /opt/Nokia/Qtopia in the ./configure stage for newer versions, as Trolltech changed where Qtopia runs from. You can use the following script to copy this to your FR, it is modified from Trolltechs update script. It will keep your settings. However you will have needed to have flashed to the 0808 version of Qtopia and kernel for this to work. Whether you do that or just keep the Trolltech released image you are now ready to write your own apps. I recommend you study the Qt docs Qtopia is pretty much Qt4.3 at the moment. This will create a qtgps excutable that you can copy to your FR and run. The app will popup on the FR screen, you could also run it from the terminal on the FR or from the file manager on the FR. To create a new application you can do this..
look in either example.cpp or qtgps.cpp and qtgps.h on how to initialize a designer based UI. There are lots of example apps on the Trolltech docs site. This will run qtgps on the local workstation in a simulation of the FR screen (without qtopia), using gps data from gpsd.rellim.com. UPDATED I figured out how to install. This document explains how to install a package so it shows up in the applications list, here is how I actually did it. I created a directory called feed in my work directory, and set the path to $HTTPDIR. Then I ran a simple web server (I used boa but any will do), that points to $HTTPDIR to serve files. The package for this is available here, (Right click to download). (Remember to generate the packages.list file using mkPackages). Setup a local web server and install as explained above. Then point your feed to http://192.168.0.200:8000/feed if using USB networking and the .qpk file is in the feed directory. This worked for this case and setup the .so links correctly. You could also copy the libgps.so from your FR. 1. Download lastest gpsd source code at http://download.berlios.de/gpsd/gpsd-2.37.tar.gz and unpack it somewhere. 2. Add line #include <linux/limits.h> to gpsd.h-head file. 5. Then make, make install, etc. Also note that the following packages need to be installed on the FR libgps16, gps-utils and gpsd. This is very nice Jim. I look forward to test this when I finally receive my freerunner tomorrow or so. I tried to build the application on Vmware GTA01 but on running make I am getting /usr/local/bin/ld: cannot find -lgps. What can be the reason. See the update at the end of the article. 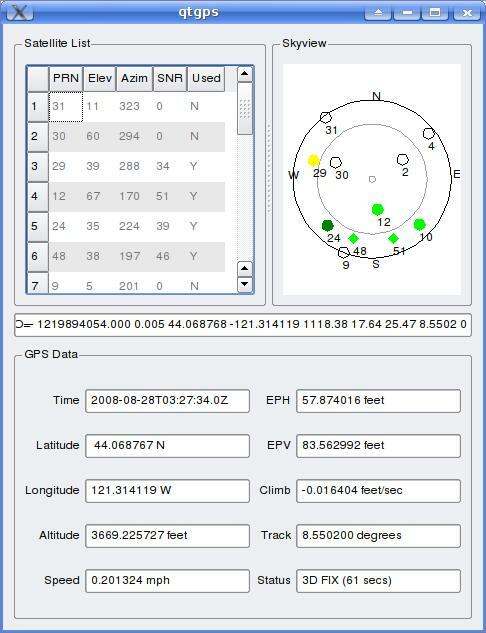 You need to install the libgps libraries in the appropriate places. There are a couple of ways to do that. Hey, this looks really nice. Any chance someone could put up a package of this? QT really rocks but its gots no GPS yet. This app is exactly what i like to have. I'll checkin the qpk, and you can follow th instructions for installing locally. I do not want to run a Qtopia feed at this time and I don't know of any others other than Trolltechs. Does this software have a metric option? Yes it does, but there is no UI yet for setting it. 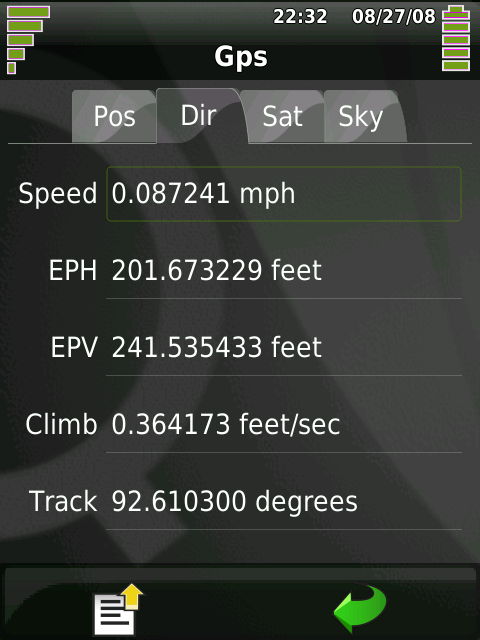 The code is the same as xgps, which has a way to set the units. It would be relatively easy to add an option for that. I followed your steps, I'm now facing a problem in make-ing qtgps. another question: how can i run qtgps in the FR without being connected to a pc? another thing are your commands to run a GUI app from the ssh into FR correct? You also need to install gpsd on the FR, I think the libgps.so is in that package if not look for other gpsd packages, and install them. Let me know which one works ;) You can also manually install it from the downloads linked in this blog. Good catch on the ssh ip I'll fix that. To run qtgps without ssh, you can install the package, or run it from the terminal or from the filemanager. Can you tell me which repository gpsd is in? Thanks I fixed the IP, and I'll update the instructions, it depends on the version of qtopia as to where it goes. Yes I can add the packages.list file, if that helps. For some reason QT does not allow apps to be installed from any source other than http. Not sure why, but that is up to Qt to solve or not. indicates that this executable is not suitable for QtExtended 4.4. Is there also a feed with a Neo Freerunner version for the actual QtExtended 4.4.2 somewhere? I have not tested this on QTExtended, so I don't know if it will work. When I tried to run it once I got a blank screen, so I'm not sure if it needs to be recompiled with the qtextended toolchain. does that mean that the 4.4.2 on neo is a dead platform?! I am waiting for Trolltech to release a newer version as QTE 4.4.2 was less stable than the previous version IMHO. No I could not get the original binary to work on the latest releases. However it should build and run if the correct libraries and toolchain are used to build it. But the reason I haven't done it is that this is really made obsolete by the new location libraries builtin to the new version. Someone needs to fork my git and update it using the location library. @Peter: I don't see any reference to qsocket in my code, all access to the GPS data is via the libgps library, you can get relatively raw data via libgps, but not totally raw. To do that you would need to talk directly to the GPS chip using ublox or other format.